This program was written due to a pet peeve of mine. Namely the relative unpredictability of what COM port will be assigned to a USB Serial dongle when I plug it in - you plug it in, Windows tells you that its connected, and then you have to dig through the Device Manager in order to figure out what port was assigned. Instead of going through that, this program runs a check every few seconds and lists all the ports that are currently available (from COM1 to COM254). You plug in your USB dongle, and within a few seconds you will see its associated COM port pop up on the list. It would be nice if this program ran in the background and just popped up a notification balloon or something along those lines, but it is unlikely that I will be touching it much in the near future as it has scratched my immediate itch. Just leave it running. 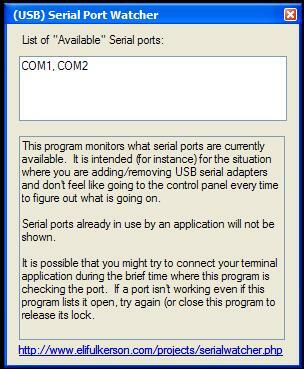 The available serial ports that it detects will be listed in the white box at the top.